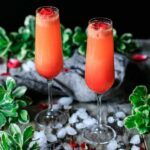 Non alcoholic strawberry citrus blush is a refreshing spring and summer drink made with three citrus juices, strawberries, easy simple syrup, and sparkling mineral water. It’s a perfect crowd pleaser to serve for kids, teens, and adults at a party, baby shower, or Easter brunch. As a child, my family would occasionally go to a strawberry farm in the Savannah area to pick our own berries. Although it was often hot in the fields, I had a great time walking up and down the rows picking berries. Since the strawberry plants had been sprayed with chemicals, we had to wait until we got home to wash and eat the berries. It was hard to wait since we lived a good distance from the farm! 😊 There’s nothing quite like freshly picked, locally grown strawberries. 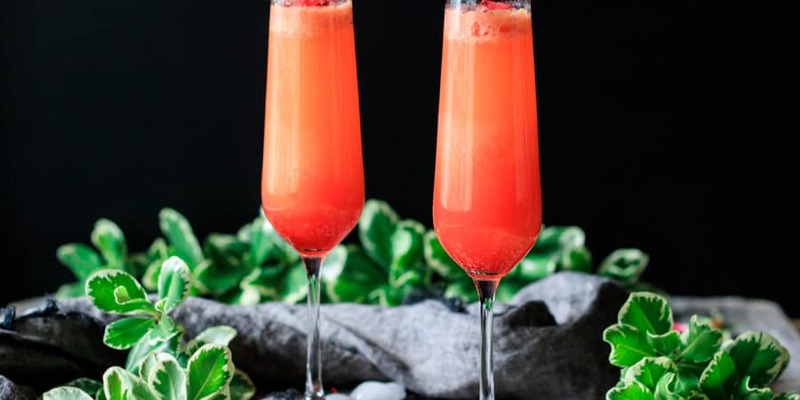 This non alcoholic strawberry citrus blush is a great way to show off fresh local strawberries this spring and summer. The drink contains pureed and sliced strawberries for a good strawberry flavor, in addition to three kinds of citrus juice. Since I love grenadine, I couldn’t help but add a tablespoon to each drink. Hey, it adds a great color and fantastic cherry-pomegranate flavor! You and your family will enjoy sipping these drinks at a spring brunch or dinner. If you love citrus and strawberries, this is the drink for you! 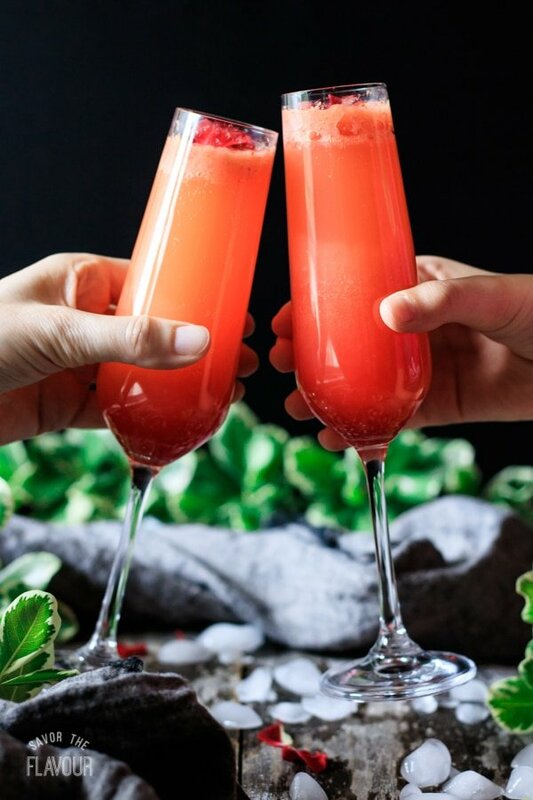 🍓🍊🍋 You also might want to check out the other non alcoholic drink recipes in this recipe roundup from Drizly, which features our strawberry citrus blush recipe. Relax and unwind as you sip on these other refreshing drinks. 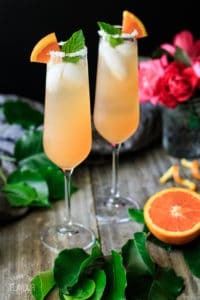 Sparkling Grapefruit and Ginger Fizz: a delightful citrusy drink with a hint of ginger and mint. 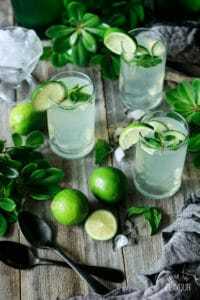 Easy Lime and Mint Refresher: this fun take on lime soda will get you wanting a refill! 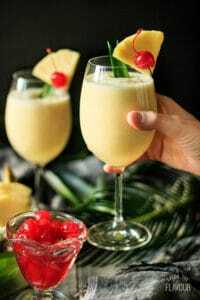 Non Alcoholic Piña Colada: you’ll be in the tropics with just one sip of this amazing creamy drink. Pour the sugar and water into a small saucepan and place over medium high heat. Stir continuously until the sugar has dissolved, then pour into a small jug with a spout and set in the fridge to cool. While the simple syrup is chilling, make the strawberry citrus juice. Zest a lemon and place 2 teaspoons of zest in a 4-cup jug with a spout. Pour the orange juice into the jug, then squeeze the juice from the lemon and a couple fresh limes. You should have 1/4 cup lemon juice and 5 tablespoons lime juice. Stir all the juices together to blend. Rinse and hull 1 pint of strawberries. Roughly chop about half of the strawberries, then puree in a blender until smooth. Measure out 1 cup of puree and stir it into the citrus juice. Slice the remaining strawberries and add to the juice mixture. Pour 1/3 cup of the strawberry citrus juice into a 7 fluid ounce glass. Gently stir in 2 tablespoons of the chilled simple syrup, the juice of one lime wedge, 1 tablespoon of grenadine, and 1/3 cup of sparkling water until well blended. Garnish with fresh rose petals that have been rinsed and patted dry. Serve immediately. For health and safety, make sure the rose petals come from bushes that haven’t been sprayed or treated with any chemicals. 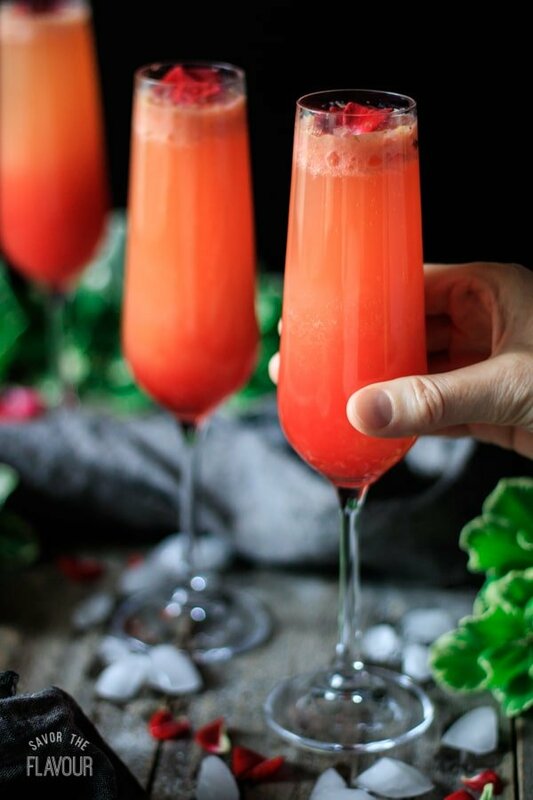 For a pretty effect, stir together the strawberry citrus juice, simple syrup, and freshly squeezed lime juice in the glass. Pour the grenadine in slowly with a funnel, then slowly pour in the sparkling water also with a funnel. Don’t stir after this, since the grenadine will naturally settle to the bottom, giving the drink a unique look.